Research speaks about aestheticism. This exhibition is about anaestheticism, it is about lack and numbness. The works by Anne Koskinen at Galleria K in Huittinen make up a whole whose main theme is anaesthetic relation. Just like everyday life, the process of creating these works both requires and also causes numbness and lack. Koskinen’s exhibition La grande dame, which borrowed its title from a champagne label, in autumn 2003 also contained signs of the anaesthetic relation. 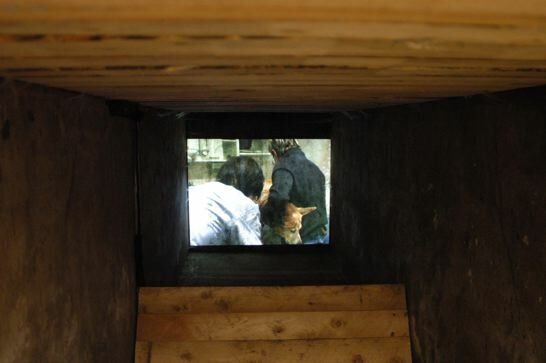 Held in the Forum Box gallery in Helsinki, Koskinen’s installation included pieces of a car, which a friend, an anaesthesiologist, had driven into a ditch on 10 August 2003. The paper pieces in the series Deus Protector Noster show Koskinen’s creative work as consisting of an everyday process of driving again and again. It is numbing also because driving unavoidably involves danger and death. On the one hand, there is a piece of paper mounted on the fender of a car with insects crushed on it during carefully documented drives. Now the insects are displayed as objects of aesthetic appraisal in a continuing series of works. By contrast, the insects on the fender next to the paper or on the windshield are simply washed away. The other reminder of danger is that the series suddenly breaks off after an accident on 20 November 2002, when the car was totalled, only to continue with a new car on 12 December 2002. It was on these trips that Koskinen also collected the roadkill she has cast in bronze. 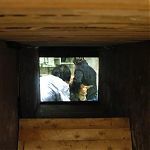 Another reminder of the anaesthetic aspect of the creation of the works is provided by the charcoal drawing of the kiln used to fire the roadkill that is included in the exhibit. 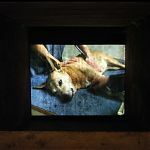 The works were previously exhibited in the Pori Art Museum in 2002, yet in this show the anaesthetic relation comes across most intimately through the death of a dear pet. 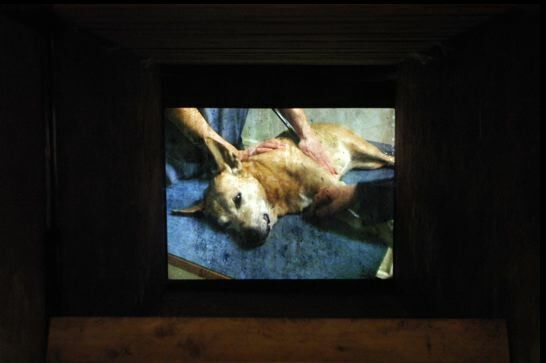 The dog put to sleep in the video entitled DEUS PROTECTOR NOSTER 15.11.2003 was nost cast in bronze.